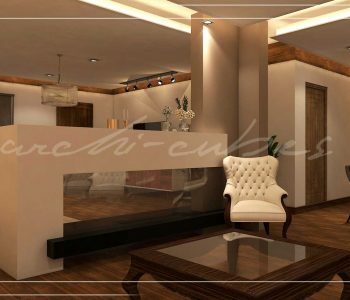 This interior space designed by the team of some of the best interior designers in Lahore in our architecture firm; Archi-Cubes, brings a whole lot of creativity and different design solutions to the table. Diving deep into the choice of materials and colors, each has its own experience to offer and each has its own story to tell. One gets a glimpse of shades of brown and beige complemented with whites and grays. The use of excessive bland colors gives the illusion of a larger space underneath the softly lit ceiling. We all agree that wood in every form is a source of aesthetics and warmth. 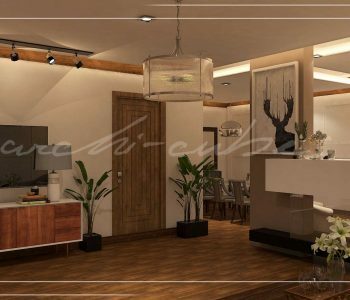 Hence, its use complementing the pearly ceiling, stretching across the floor and ornamenting the walls in the form of doors gives off an antique vibe mixed with flashy contemporary metallic ornaments. The leafy green pots bring a hint of nature into the antique and contemporary blend. The leafy green pots bring a hint of nature into the antique and contemporary blend. The fixtures give the interior a whole new meaning. 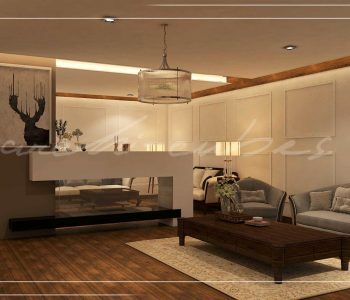 Each sitting area has its own theme to offer, be it a mixture of greys, the conflict of black and white or beige and brown complementing each other. 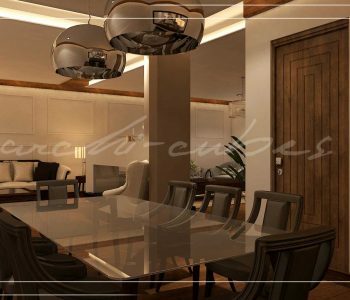 The lighting fixtures are one of the most interesting selections by our interior designers which add to the design with shiny metallic themes. The proportions and volumes are not only acting as zone dividers but also boldly adding to the color palette. The walls themselves act as ornament of some sort. The detailing on them gives the 3D element mixing well with the simplistic ceiling and bland colors. The ceiling with hidden lights gives depth to the whole ambiance. Simplicity with a dash of detailing and complexity gives a whole new unique vibe.